In my last post I alluded to something that happened before we left Naples…it actually occurred at the airport at 5:30 a.m. While Paul was paying for our extra baggage, Shannon pointed out a man with tattoos who had matching Louis Vuiton bags, one of which held a small dog. However, when I turned I only saw a woman with a baby standing by the bags. 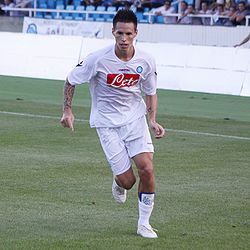 Marek Hamsik. He’s a soccer player from Slovenia who plays for Napoli. As Paul approached I not-so-calmly told him that Hamsik was indeed only feet from us and he should go talk to him, which he did not do, so we proceeded to our gate. And upon arrival…who did we see?? That’s RIGHT!! HE WAS ON OUR FLIGHT! So we sit behind him, his wife, and his son….oh, and his dog, which Lily played with. We (ok, really Paul) talked to him a little, got him to sign his game ticket from the Napoli vs. Roma game, which Napoli won. And we talked to him and his wife while waiting for our strollers. Just wanted to share this little touch of famous with you. you guys are such ballers.